This Lennar Homes Texas review comes from Houston and was originally posted on the Better Business Bureau website. The original review was slightly modified for formatting, grammar, and context. 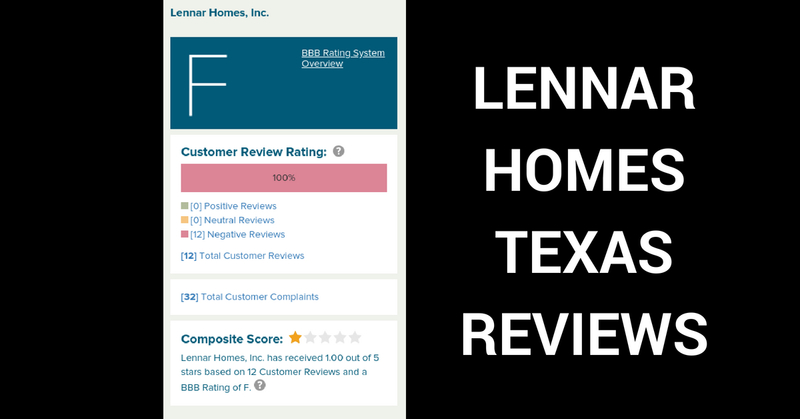 Note: As of this article’s publication date, Lennar has a BBB rating of ‘F’ in Houston, Texas. So ok, we gave them a chance and we decided to have a structural engineer come out and look it over. His report supports issues due to improper building methods. Why didn’t the construction superintendent catch this? Seems like Lennar just decided to blow past it and “cover up” the defective work. Now we have yet another issue to disclose if we ever wanted to sell and this should not be considered under warranty because it never was built correctly in the first place. We’ve had other issues with the house as well, but this is the most serious. Lennar does a bad job building houses. Period.